Stress is going up in the world — which makes emotional intelligence even more important! Research shows that EQ skills are key to managing complexity. As complexity increases, we need to work harder and more directly to put EQ skills into place. What about in business, education, family & government in Singapore and Malaysia? Awareness is growing, but the question over and over: How do we actually USE emotional intelligence? How can we apply these skills in a scientifically robust way that is practical? This November, it’s time for the answer. 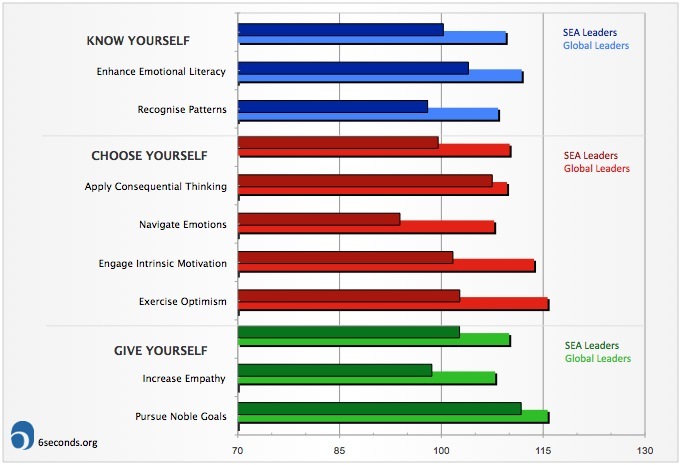 Tools and methods to apply emotional intelligence. See the events for November, 2015 below. How about in Singapore and Malaysia? The latest emotional intelligence data for Singapore & Malaysia has good news and bad news. As of today, based on 1170 assessments in English from SG & MY in 2014 so far… but first: If you’re based in SEA, please take this brief survey and let us know how we can help you spread emotional intelligence. Since The Six Seconds Model of Emotional Intelligence is a set of learnable competencies: It means that we have a clear path to improve these work & life outcomes. #1: Navigate Emotions — this skill allows leaders to tune into their emotions and harness them (not just control feelings). It’s essential for leaders themselves to handle emotions — and moreover, for creating the right emotional tone for employees to flourish. #2: Exercise Optimism — leaders with this skill are solution-finders; it’s key to innovating and getting out of the box — rather than following someone else’s path. #3: Engage Intrinsic Motivation — where many people are driven by external factors (carrots and sticks), this capacity lets people drive from within. For leaders, it’s invaluable for creating momentum in self and others. In the “almost good news” category, the SEA group is “neck in neck” with the global sample on Pursue Noble Goals (putting vision & purpose into action) and Apply Consequential Thinking (looking before you leap). What to do? The solution is to embed powerful EQ development in educational institutions and in L&D for every company that wants to stand out in the global market. The Six Seconds EQ Certifications are a proven approach, and over 500 professionals in the region have attended the programs over the last decade. Now, for the first time ever, the “Advanced EQ Trainer” program is also coming to Singapore. The results are revealing. Culturally and traditionally, Asians in general do better in maths and hard sciences. 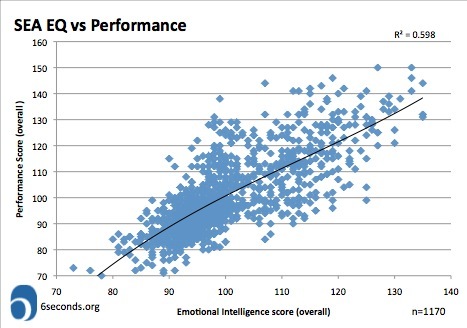 So the gap in emotional intelligence is not surprising. It could be a combination of the education system (focusing on logical thinking) and the meritocracy culture (focusing on concrete deliverables). It’s a shame the gap is across the board. I think the findings could correlate to Hofstede’s Cultural Dimensions. The gap in Navigating Emotions may relate to the indulgence vs restraint dimension; and the smaller gap in Pursue Noble Goals may be supported by the long term orientation. Insightful findings that support the already-strong case for Leading with EQ. Greetings from Traders Hotel Kuala Lumpur! Currently I am looking for EQ Certification Course around our area. Will that be any courses organized this year either in Malaysia or Singapore? Wish to hear from you very soon. Thank you and have an EXCELLENT day!